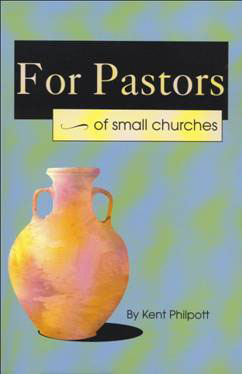 This book is written specifically for pastors of small church. Most churches are small churches yet they are the backbone of Christianity. Kent Philpott has been the pastor small churches for thirty years, and one large church, and in 57 chapters has provided some helpful material for pastors. In this issue is Chapter one, “ Preaching the Gospel,” which is the chief goal of all pastoral ministry. Public Ministry—Is It a Performance? One day toward the end of my first year as pastor of Miller Avenue Baptist Church, a young man knocked at the door of my office. He had spent the better part of the day going from one church and pastor to another asking how he could become a Christian. For months he had been reading the Bible and listening to television and radio preachers, and he was determined to get to the bottom of it. “Sit down a minute, relax, and let me tell you the gospel,” I said as reassuringly as possible. For twenty minutes or so I told him about the finished work of Jesus. In the midst of my presentation he suddenly declared, “Oh, I see now, Jesus did it for me.” An hour later, he left, at peace; the seeker had been found. That encounter became one of the highlights of my ministry. This story dramatically illustrates the centerpiece of the gospel. This man wanted one thing—the good news of Jesus—and when he heard it he knew it was what he sought. Now I would remind you, brothers, of the gospel I preached to you, which you received, in which you stand, and by which you are being saved, if you hold fast to the word I preached to you- unless you believed in vain. For I delivered to you as of first importance what I also received: that Christ died for our sins in accordance with the Scriptures, that he was buried, that he was raised on the third day in accordance with the Scriptures, and that he appeared to Cephas, then to the twelve. The gospel is Jesus, both who He is and what He did. Christianity is Jesus Christ Himself. To preach the gospel is to preach Jesus. Someone has said that good preaching is bragging about Jesus. Jesus is God in the flesh, at once truly and completely God and truly and completely man. Jesus is the eternal, uncreated Son of the Father, who freely chose to empty Himself, take on flesh, and be born of the Virgin Mary. Having lived a sinless life, He was crucified and died under the administration of the Roman governor Pontius Pilate in about A.D. 33. He was buried, and on the third day He rose bodily from the grave. He ascended to heaven forty days later, where He is now seated at the right hand of the throne of God, which is the place of power and authority. He will come again a second time to judge the living and the dead. He is the Lord of all, and ultimately all knees will bow to Him. Jesus died in our place as our substitute. He took our sin upon Himself. His death satisfied the just demand of a holy and righteous God who is offended by sin. The blood that Jesus shed cleanses those who trust in Him, completely washing away all sin—past, present, and future. Jesus’ work on the cross justifies sinners, and at once the sinner is declared righteous. The righteousness is imputed or placed within those who trust and come to Him. By the working of God’s Spirit we are able to repent and believer; both repentance and faith are gifts of grace. This is conversion or the new birth, and at that moment the sinner is indwelt by the Holy Spirit and given eternal life. “Justification by faith” is the great, biblical and reformation truth. “Sole fide,”—faith in Jesus alone brings salvation. This gospel must be faithfully and honestly presented to the unconverted. The gospel preacher is Christ’s ambassador and should speak as though God Himself was making a personal appeal. The gospel preacher beseeches, implores, and pleads for sinners to be reconciled to God (see 2 Corinthians 5:20). Good preaching incorporates earnest pleading with the unconverted to come to Jesus; an impassioned call to trust in Jesus alone is the singular characteristic of the great preachers. Additionally, the preacher is an ambassador for Christ and not for the church, a creed, or a theological system. The gospel preacher urges trust in Jesus beyond a mere intellectual understanding that Jesus died and rose again; simply accepting facts will not result in new birth. The facts of the gospel are to be preached as well as the need to turn to Jesus in repentance and faith. A person may acknowledge and confess doctrinal truth yet remain unconverted. Conversion is coming to Jesus and trusting that His shed blood is sufficient to atone for sin. The gospel is heard through the preached Word (see 1 Corinthians 2:4). As the gospel is preached the Holy Spirit both convinces of sin and draws or calls a person to j. The preacher is never able by the use of clever means to make salvation happen; the preacher must rely upon the Holy Spirit to bring about true conversion. In my view, however, a pastor’s chief responsibility is the preaching of the gospel so that unconverted people might come to Jesus. Most churches are structured so that the pastor bears the bulk of the gospel-preaching responsibility, unless there is a resident evangelist or apostle. According to some New Testament expositors, all “normal” first century churches had evangelists and apostles whose primary focus was preaching the gospel (see Ephesians 4:11-12). I am not personally aware of contemporary churches that have a ministry office designated “apostle” or “prophet” or “evangelist.” Most small churches typically have one pastor/teacher, and such is the case at Miller Avenue Baptist Church. Therefore, it falls upon me to be the evangelist. I carry the responsibility of proclaiming the gospel. If there were another pastor serving alongside me, then I would be free to do the work of evangelism. Until then, I am charged with preaching the gospel and leading in the church’s ministry. My great joy is to preach the gospel, whether to a small or large group, or to a single individual. I have often said that when it comes to being a pastor, I don’t rate high on the giftedness scale. On a scale of one to ten, I probably rate a four, but as an evangelist I would probably rate a six. And I imagine there are many pastors like me. The typical congregation is blessed with a wide variety of spiritual gifts. However, few are called to preach the gospel. In Romans 10:14 Paul asks, “But how are they to call on him in whom they have not believed? And how are they to believe in him of whom they have never heard? And how are they to hear without someone preaching?” In verse 17 Paul then says, “So faith comes from hearing, and hearing through the word of Christ.” Clearly, there is no greater joy than preaching the gospel. It is the highest calling of pastoral ministry, for “How beautiful are the feet of those who preach the good news” (Romans 10:15). I do not believe the gospel message is to be tacked casually or perfunctorily onto the end of a sermon. When preaching a conversion-oriented sermon, I will do so from beginning to end. When I preach strictly to the converted, the entire sermon will be of a practical nature. This is a generally accurate description of my method, but there are exceptions. Sometimes I will give the gospel out when preaching to believers. We can never be sure that all whom we think are converted actually are so. In any case, I feel that preaching the gospel is my primary calling in pastoral ministry, and I will do it in whatever way I can. I pursue it on Sunday mornings, and through a community access television program aired weekly. Now, in an attempt to take advantage of current technology we are now streaming our Sunday morning services, (see www.ustream.tv), and yes, there is YouTube, Twitter, and Facebook. It is no longer possible to count the number of people receiving some kind of gospel message input via the various electronic methods I now utilize. It is not self-promotion, just other ways of presenting the gospel. Preaching the gospel must be emphasized for two main reasons. First, unconverted people do not feel comfortable hearing the gospel, because it offends them. When they hear of their need to turn away from sin and trust Jesus, their sense of being internally convicted of sin makes them uncomfortable. Many people think that Christianity is simply about love and that there are many paths to God. When a straightforward gospel message is preached that rejects such popular notions, there is offense. The object of that offense is often the preacher, who may sense this and be tempted to soften the gospel message or cease from preaching it altogether. The second group of listeners who are easily offended by the gospel is the “christianized”—those who suppose they are genuine Christians but, in fact, are not. I have a particular sensitivity to this group, because I have played a role in too many of them becoming christianized over the course of my ministry. For twenty-nine years I did not understand the mystery of conversion and the tremendous danger of false conversion. The christianized are not able to tolerate conversion-oriented sermons. A fear they do not understand arises within them, and they feel threatened. The christianized generally prefer positive sermons with inspiring stories. They claim to need something that will motivate, inspire, encourage, and support them. They favor “how to” sermons—how to overcome anger, how to be successful in a crazy world, how to be this or that. The converted, in contrast, love to hear the gospel preached. Such preaching builds them up and helps them grow up into the fullness of Jesus. “I love to tell the story” or “Tell me the old, old story” are the words of great hymns that reflect the heart of those who are genuinely born again. The preaching of the gospel cuts like a double-edged sword—it brings both life and death. Here is Paul’s assessment: “For we are the aroma of Christ to God among those who are being saved and among those who are perishing, to one a fragrance from death to death, to the other a fragrance from life to life. Who is sufficient for these things?” (2 Corinthians 2:15-16). Pastors preach the gospel and preach it with clarity and strength. For many pastors this is their greatest source of satisfaction. There is no greater joy than to preach the good news of Jesus Christ. * I include a presentation of the basic content of the gospel because I did not know much of it in the early years of my ministry and therefore do not assume that everyone has a clear grasp of it. Of course, I thought I knew the gospel as a new pastor and would have felt insulted if anyone had suggested I did not. I do find, however, that my understanding of the gospel seems to grow; I am still learning it.